Genius' HD520 is dirt cheap, but is it good value? The silver body of the HD520 boasts 'Perfect HD' – a claim that seems certain to be compromised by its microscopic F3.2 pinhole camera lens. You can snap stills at a mighty 11MP, select an electronic image stabiliser (the optical version's poorer cousin), and even use manual equivalents for the exposure and white balance, along with the auto staples. It comes with a negligible 32MB built-in memory that you will need to expand up to an extra 8GB with an SD card. 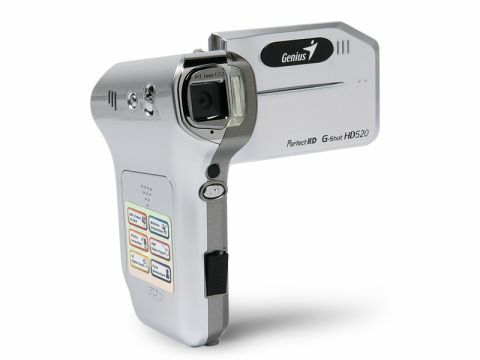 A few minor features, such as a grainy 5x digital zoom, face and motion detection and voice recording are also present. It lets you listen to music, record audio, read e-books, and watch portable media, too. Colourful, clear menus are easily spun through using a navigation stick that moonlights at various other roles depending on the mode. Sadly, operating these controls with the joystick is a process with few intuitive short cuts. Video and stills are realistic in their presentation of colour and will capture both to a degree that will satisfy those without any movie capture ambitions. But it's not just motion and varied lighting situations that reveal its limitations. Anything beyond the scope of the macro mode is weak on detail. The microphone does no more than reproduce noise in its most basic recognisable form. Overall, it's still a good value package, but what it produces is not HD as you might know it.